See the best of Los Angeles when you head west to the peaceful refreshing waters of Marina del Rey. Hornblower Cruises & Events is the premier public dining cruise and charter yacht company in Marina del Rey. Lounge on a lavish yacht for Champagne Brunch Cruise, Weekend Dinner Cruise or Sunset Cocktail Cruise with chef-prepared meals, classic cocktails, dancing and the most remarkable views in the marina. Hornblower Cruises & Events offers private yacht charters. From intimate weddings and over the top celebrations to team building outings for corporate groups. Hornblower is able to service any guest's unique needs while creating amazing experiences. 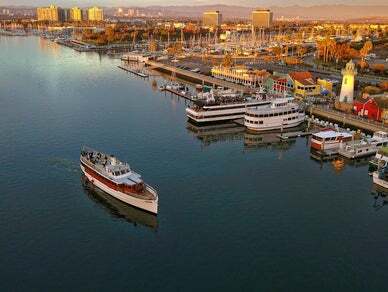 Enjoy the scenic views from one of our Greater Los Angeles Areas: Marina del Rey and Long Beach. Select one of our beautiful wooden vessels for a vintage look or dine aboard one of our sleek, modern yachts for an updated cruise. Let Hornblower take care of the details while you and your guests enjoy the scenic views, the delicious food and the good company that surrounds you. Enjoy a boarding glass of champagne, a delicious dinner buffet, and take a stroll on the outer decks and check out the amazing views! All prices include taxes and gratuities. Watch the sun go down before enjoying a romantic three-course dinner prepared fresh on board by our chefs. Then watch the sights drift by from the outdoor decks. Take in the sights, listen to relaxing music, linger in the sun and visit the Captain. Our lavish brunch buffet features a savory selection of all your favorites and includes complimentary champagne.